Honorary Degree of Letters in recognition of his significant contribution to journalism and broadcasting, and for his continued involvement in the work of Nottingham Trent University’s Alumni Association. 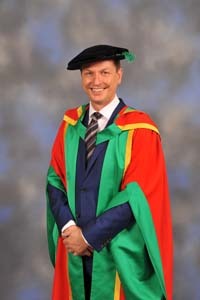 Stephen Dixon studied a BA Honours degree in Broadcast Journalism at Nottingham Trent University from 1992 to 1995 – the first degree of its kind in the country. As part of his degree Stephen gained the invaluable experience of operating in a living and breathing news room. After graduating he became a producer and presenter for ITN, NBC Superchannel and Channel 5. In 2000, he was poached by Sky, beginning life there as the overnight anchor for Sky News on the hour. He also freelanced as producer programme editor of the news on Channel 4’s popular, long-running morning show Big Breakfast. Stephen has presented the flagship programmes Sky News at Seven and Sky News at Ten. He currently presents the Friday and weekend editions of Sky News Sunrise. He was the first newsreader to report on the July 2005 London bombings and was Sky’s at-the-scene reporter in the days that followed this tragedy. Out of the newsroom Stephen is a dedicated campaigner and official ambassador for Diabetes UK, having been diagnosed with Type 1 diabetes at the age of 17. For five years Stephen was also President of the NTU Alumni Association and we are very grateful to him for all the work he did and continues to do for us.